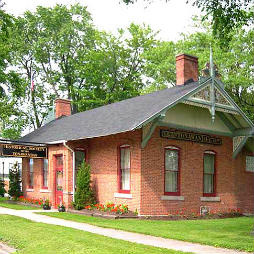 The former New York Central Railroad's Tonawanda Station, built in 1886, now includes our museum exhibits, a research library, photo archives, computer database of all collections, gift shop, and the Historical Society of the Tonawandas office. Outside are a 1925 monument In Memory of the Soldiers, Sailors, and Marines of the Civil War of 1861 to 1865. There is also a Commemorative Garden with stone markers dedicated to World War I Veterans.